The Verillas Versatta Series Courage Hybrid Tartan Kilt is a must have for any traditional tartan kilt wearer. Featuring a 23" length that hits right below the knees, you can maximize performance even if you are a rigorous Tough Mudder. This modern utility kilt is constructed with a durable heavy cotton-canvas fabric body and acrylic wool pleats and are bound to stand up to the tasks of any bold adventurer. The Velcro front panel closure and stretch elastic waistband allows for a secure, comfortable fit with up to 8" of adjustability in each size. Our signature V-belt loops allow you to pair the Versatta Series Kilt your favorite kilt belt up to 3" in width. Removable and interchangeable side cargo pockets allow you to personalize your kilt to suit your adventuring needs. 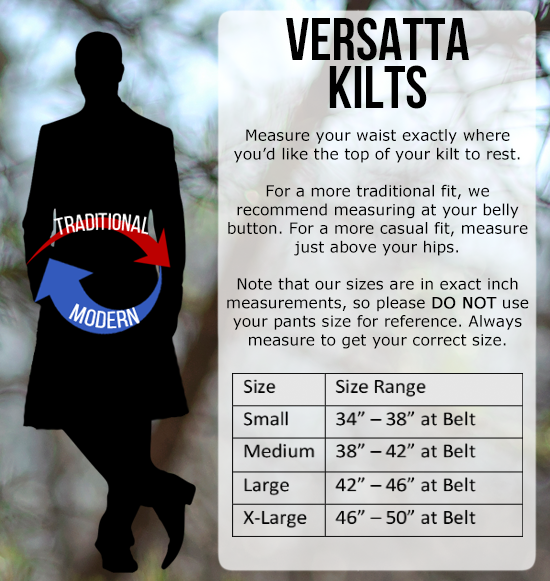 Whether you are out on the town or exploring the great outdoors, Versatta Series Kilts have you covered. Perfect for faires, festivals, cosplay, reenactments, weddings, daily wear, and more! *Only select the Pre-Order option if the In Stock option is not available. This item is in a rolling 90 day production cycle and any Pre-Orders will be filled within 90 days of being placed.